Hai!! I am currently on vacation with my boys (our first since our honeymoon 6 years ago!) but I had to pop in with these cupcakes because, I mean, look at them! They’re from Molly Yeh’s new book, Molly on the Range, and they are homemade funfetti perfection. Her book is full of charming stories, fun recipes, and Molly’s warm, candid writing. Of all the incredible, marzipan and tahini-laced recipes, naturally, I went for the funfetti cake (because sprinkles! ).I decided to make these as cupcakes because they’re cute (duh) and so I could easily pawn them off on our neighbors because I am NOT to be trusted with a whole layered, funfetti wonder of a cake. 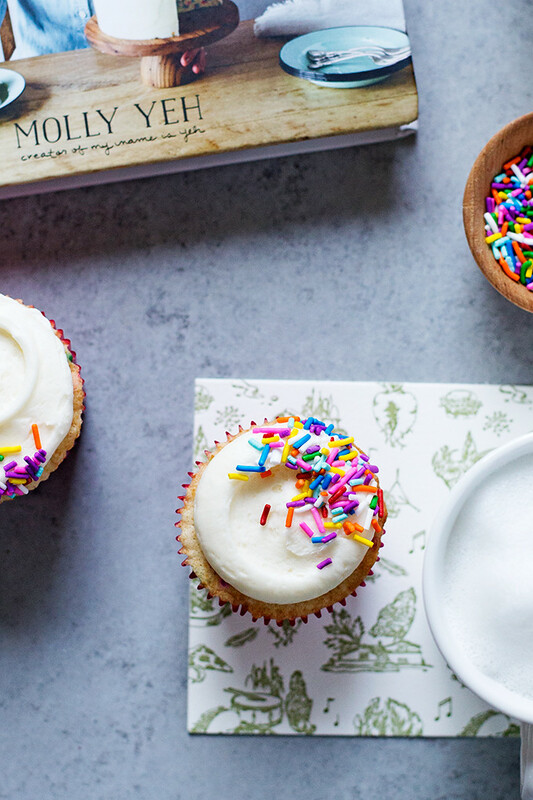 Molly has done us all a favor and put in the work to make the perfect, homemade funfetti cake and it shows in this recipe. 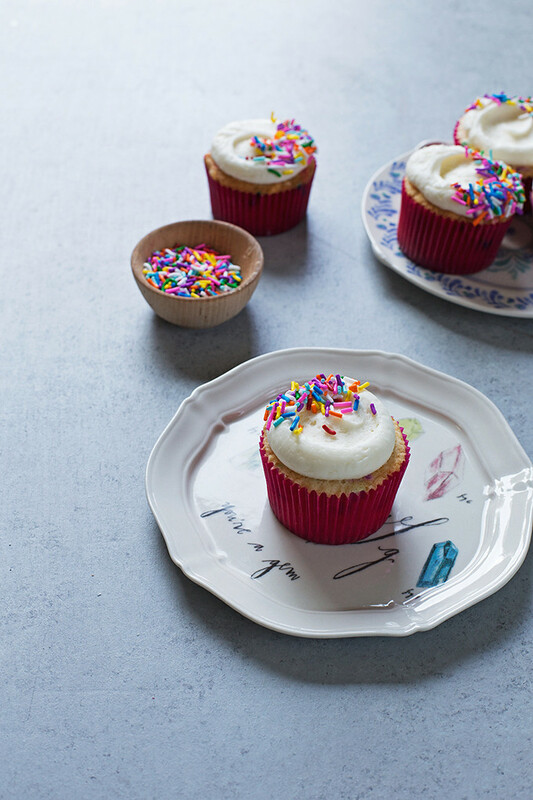 They taste, look, and smell just like classic funfetti cupcakes but even better, if you can imagine that. 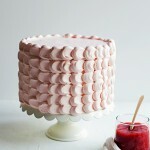 The texture of this cake is spot on. There’s a bit of cornstarch in the dry mix which seems to keep these cupcakes solidly in the moist and fluffy category. Like all my favorite cake batters, this one bakes up with with a finely textured crumb, it suspends the rainbow sprinkles in the batter and doesn’t let them sink to the bottom. The flavor is what I think of when I think Birthday Cake. It’s all thanks to that clear, imitation vanilla extract, aka the extract of childhood birthdays and rainbow sprinkled everything. 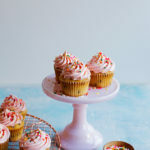 It’s a flavor I’ve used before (in these Frosted Birthday Cake Cookies) and it is one of the most important ingredients that will make these cupcakes taste like the funfetti cake we remember and not just a standard vanilla cake. Basically, it’s important so don’t fear it! The second most important ingredient are the sprinkles. According to Molly, jimmies, aka those little stick-like sprinkles, work best. We’re talking your basic, run of the mill, artificially colored rainbow jimmies. Save your all-natural, homemade sprinkles for something else and just go with the ones you can find near the ice cream toppings. They’ll provide the pops of rainbow color that are the signature of funfetti cakes everywhere. Molly on the Range is worthy of a spot on the bookcase just for this recipe alone, but there are a ton more that I’ve already earmarked (all the HUMMUS). Plus, the book is full of beautiful photography, whimsical illustrations, and happens to be one of those cookbooks that you can read cover to cover (my favorite). I was gifted a copy of Molly on the Range. As always, all opinions, images, and words are my own. Thank you for supporting the community that makes Hungry Girl por Vida possible! 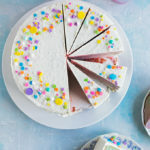 Moist, tender vanilla birthday cake studded with a flurry of rainbow sprinkles. Preheat the oven to 350°F. Line 2 muffin tins with 24 paper liners. In a medium bowl, whisk together the flour cornstarch, salt, and baking powder. In a stand mixer fitted with a paddle attachment cream together the butter and sugar until light and fluffy, 3 to 4 minutes. Add the egg whites, one at a time, mixing well after each addition. Add the oil and extracts. With the mixer running on low speed, add the dry mixture and the milk in two or three alternating batches and mix until just barely combined. Using a rubber spatula, fold in the sprinkled until they're evenly distributed. Distribute the batter among the muffin cups. Bake until a toothpick inserted into the center of a cupcake comes out clean. Begin checking for doneness after 20 minutes. Cool in the pans for 10 minutes before turning out onto a rack to cool. To make the frosting:In a stand mixer fitted with the paddle attachment, beat the butter until smooth and gradually beat in the powdered sugar. Add the salt, extracts, and milk and beat to combine. This recipe is reprinted with permission from Molly on the Range by Molly Yeh. I used a mixture of basic sprinkles I found at my grocery store and Sweetapolita Classic Rainbow Jimmies. Happy vacation! 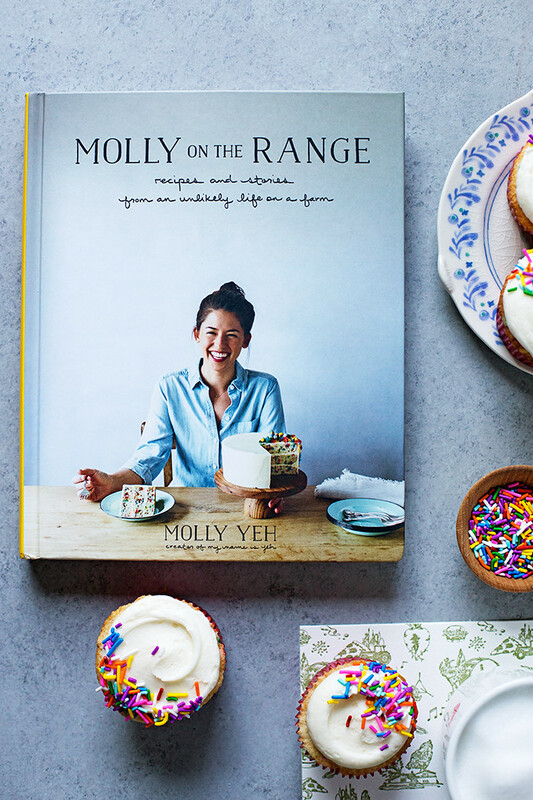 These cupcakes look perfect and I can’t wait to pick up Molly’s cookbook! for the frosting–do you want 1 3/4 sticks butter or 1 3/4 cups? This is confusing to me and I am wanting to make these as soon as possible. Hi Karen, sorry about the confusion! It’s 1 3/4 cups! Molly is a cake genius. I really can’t wait to get my hands on her book! What sprinkles do you use? I love the color mix! Hi Cindy! Where did you get your sprinkles/what brand are they? I love the colour combination and that there are no BROWN sprinkles in the mix! So cute, Cindy!! Sprinkly perfection! Have a fabulous vacation! 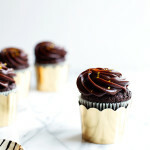 these are some of my favorite cupcakes and the photography just makes them even more mouth watering!